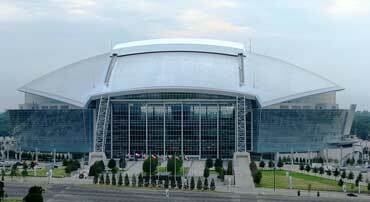 It is a football stadium. Stadiums are large buildings with seats for sports fans and a field for players. Stadiums have large parking lots. Why are there lines on the field? The lines mark the distance that players need to cover to reach the other team's goal line. 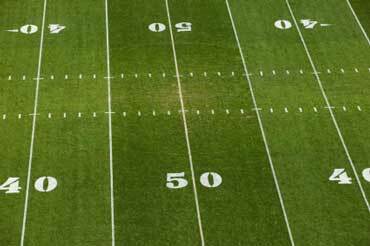 Football fields are 360 feet long and 160 feet wide. Copyrights to the pictures and photos on this ESL and EL Civics website belong to individual photographers. We have purchased the rights to use them. Do not copy the images on this educational website. Permission is granted to print any of the worksheets for classroom use. Contact Christina Niven, ESL teacher, at christina@elcivics.com. Please send corrections and requests for new lessons. Copyright © Christina Niven, 2007.